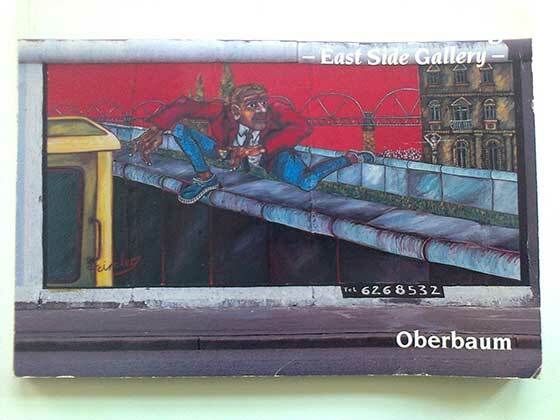 In July 1990, Lotte Haubart and I read in the Danish daily Politiken about East-Side-Gallery – and the fact that no Danish artists had contributed yet. 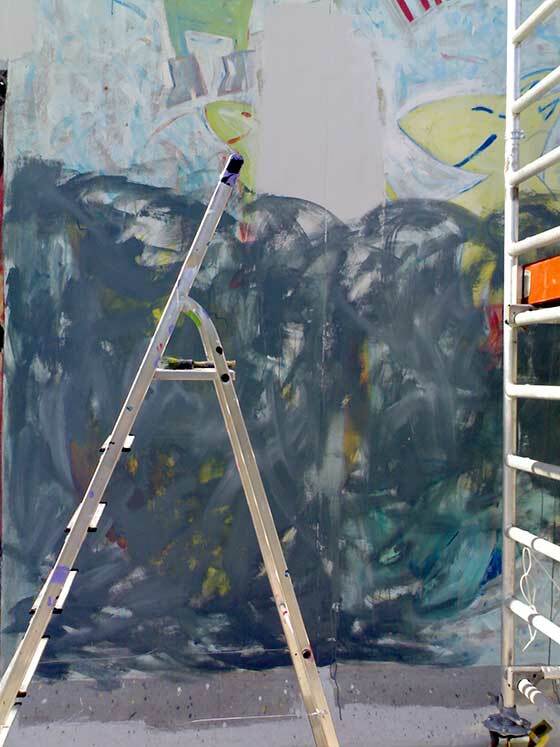 Two days later we were on the train with paint, brushes and sleeping bags and quickly completed our painting HIMLEN OVER BERLIN/HEAVEN NO. 7/7 ÜBER BERLIN in the fumes from the Trabbis speeding by behind us. 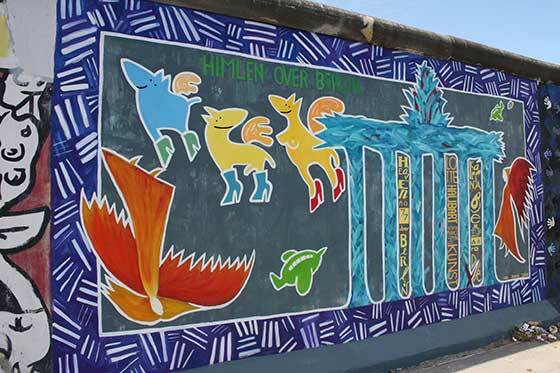 We painted directly on the Wall and a single piece of grafitti – REPS RAUS! 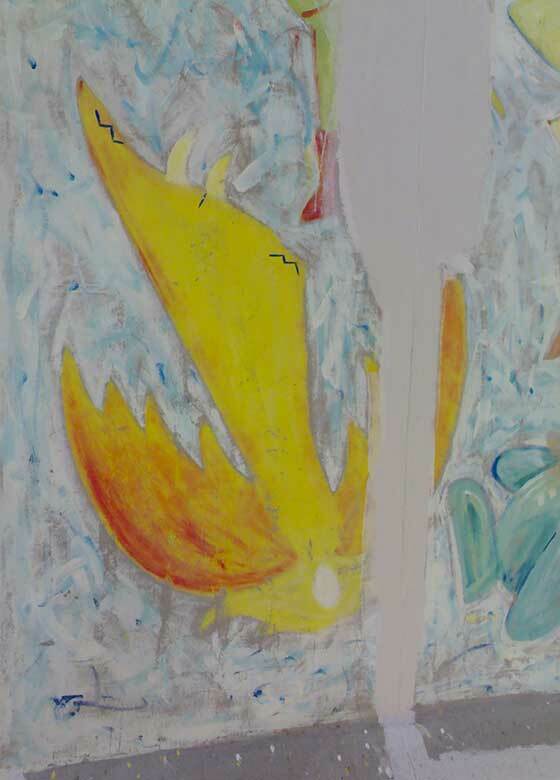 – could faintly be seen under our painting. 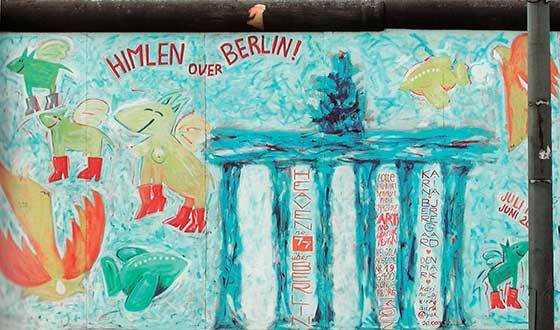 The painting captures the joy and freedom of being able to walk – or fly – through Brandenburger Tor. 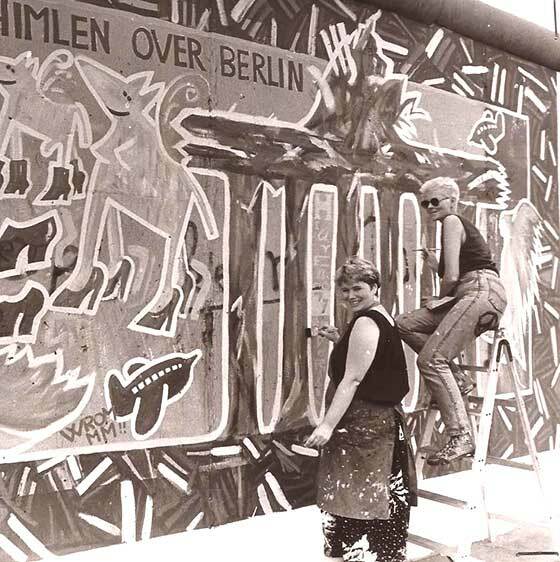 The two angels, Nina and Wim, are two of our heroes from that time: singer Nina Hagen (who sings “I live in heaven no. 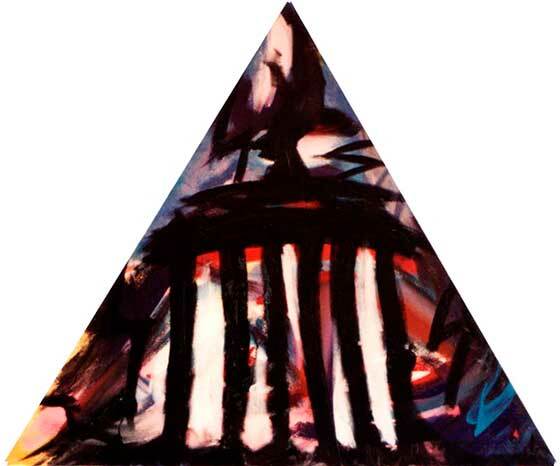 7/7”) and filmmaker Wim Wenders (who made the film “Wings of Desire” – “Himlen over Berlin” in Danish). The little, green airplanes were part of a travel ad we saw in the U-bahn. 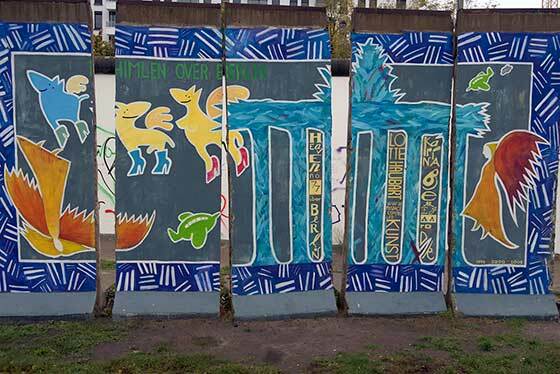 It was a great moment for me to touch the real Brandenburger Tor after having painted many versions of it after the fall of the Berlin Wall. 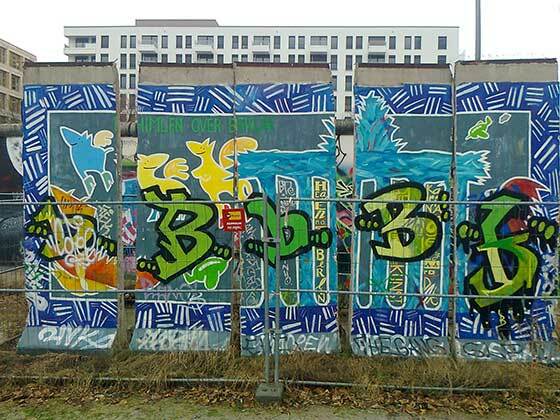 Berlin at that time was still a divided city: The train tracks stopped midair between Warschauer Strasse and Schlesisches Tor! 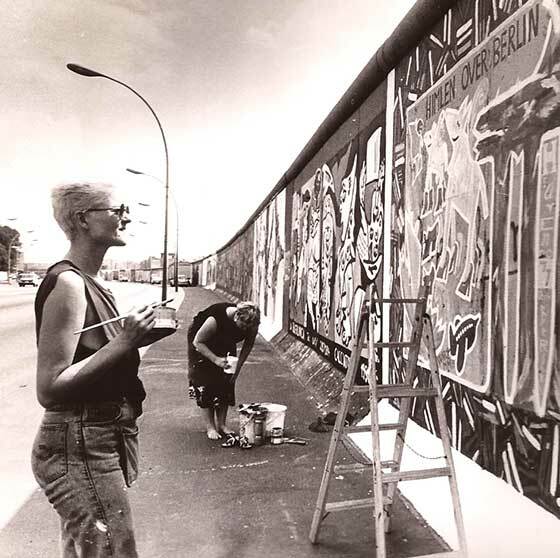 Through the 90’s, East-Side-Gallery deteriorated due to pollution and grafitti, so in sunny June 2000 Lotte and I were invited to come and restore our painting. And this time we didn’t have to bring our own art supplies. 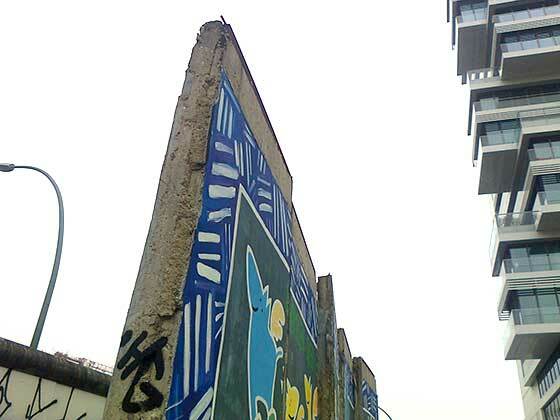 But HIMLEN OVER BERLIN didn’t need restoring, it needed repainting! So we repainted HIMLEN in lighter colours, and Lotte decided to leave out the purple pattern border. 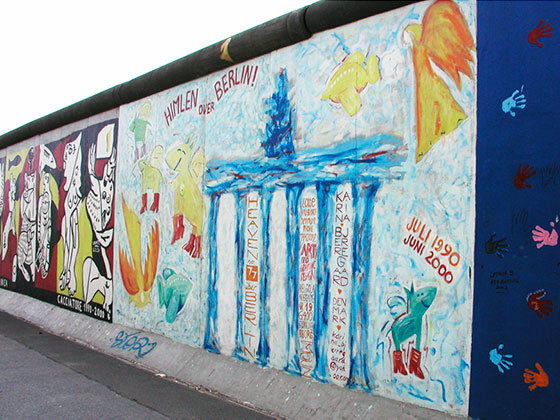 During the 00’s I was in Berlin often, and it made me so sad to see how people vandalized one of the top tourist attractions in Berlin by scribbling their names with no respect for the artists’ work. I always asked them not to destroy our paintings. 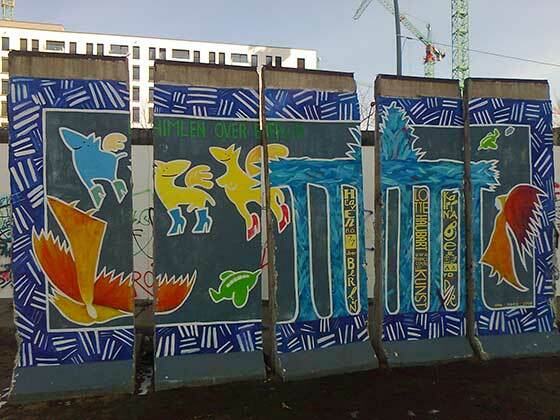 For the 20th anniversary of the Fall of the Berlin Wall in ’09, we were once again invited to restore HIMLEN OVER BERLIN. And things were brighter economically: Not only were there paint supplies, we also didn’t have to pay for the trip, food or lodging ourselves. For the third version of HIMLEN we chose to go back to a more 90’s look. 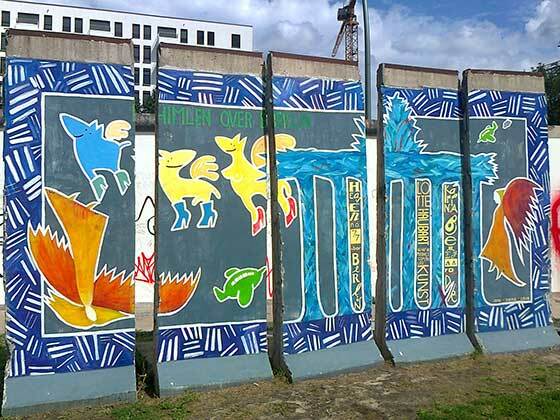 First we gave the Wall the colour Berlin Pollution Grey. 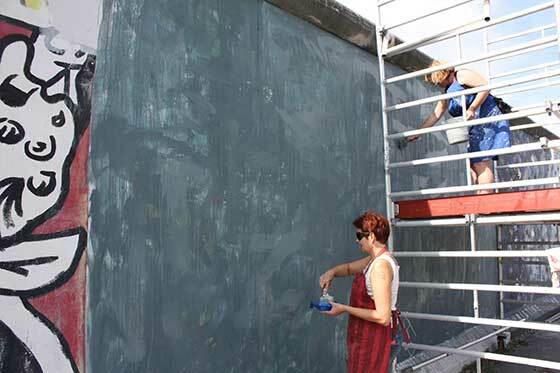 We finished our painting in September, and now the No Man’s Land behind the Wall offered beach bars with mojitos for refreshing the artists. 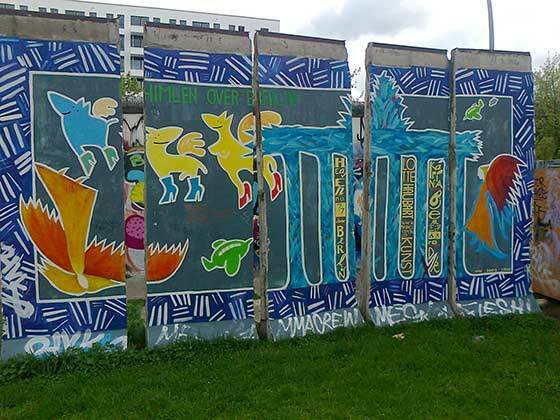 Fortunately I was able to come back for the rainy celebration in November ’09, where Berlin mayor Klaus Wowereit delivered a touching speech, reminding us how happy we were in 1989 despite all the later problems. 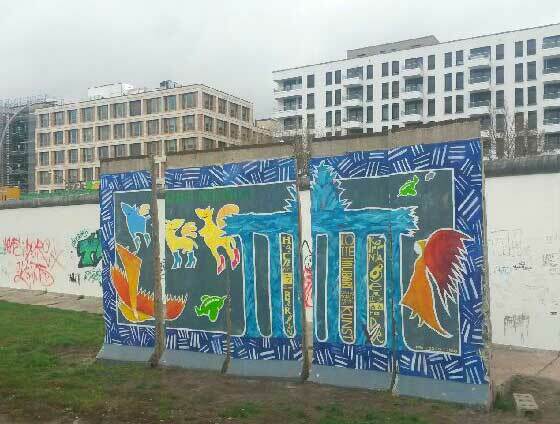 In March ’13, HIMLEN OVER BERLIN was cut out of East-Side-Gallery and placed in the former No Man’s Land behind the Wall despite East-Side-Gallery being placed under Denkmalschutz. 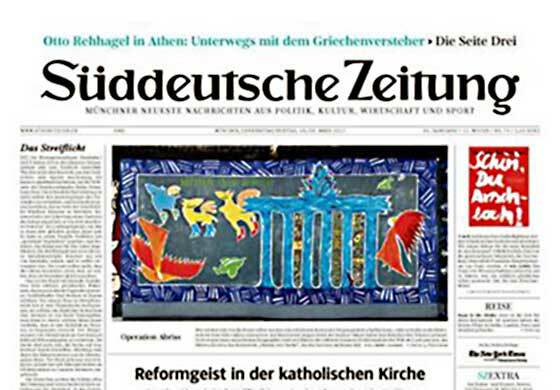 The painting was on the front page of Süddeutsche Zeitung (circulation: app. 400.000). 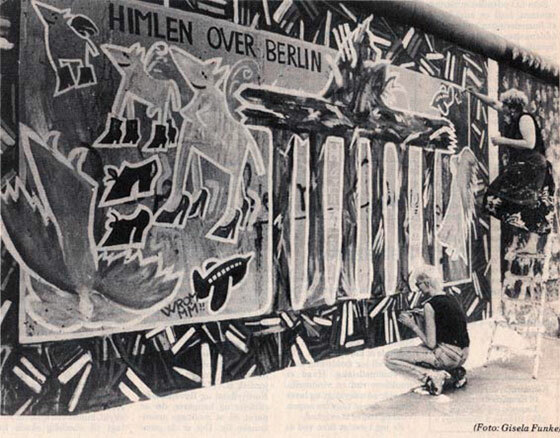 There were massive protests from the people of Berlin, but to no avail. 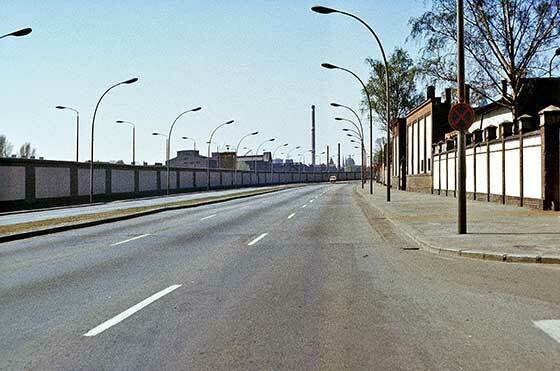 The luxury high-rise building stayed, and HIMLEN was no longer part of East-Side-Gallery. 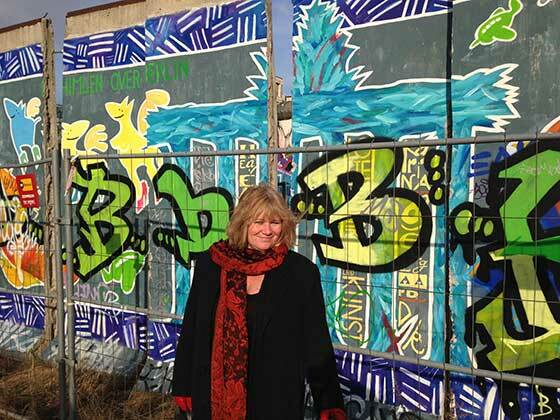 It was unprotected and hidden away where it was vandalized by idiots with spraycans and all the usual scribblers. 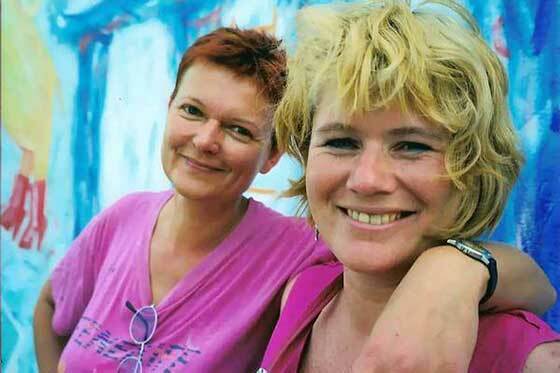 I was very sad to see my art and my artist’s rights being treated so respectlessly! Read an interview with me from 2013 here. 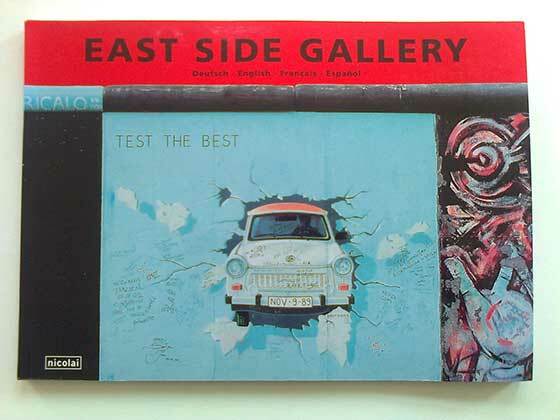 In January ’17 I met with some of the East-Side artists again. 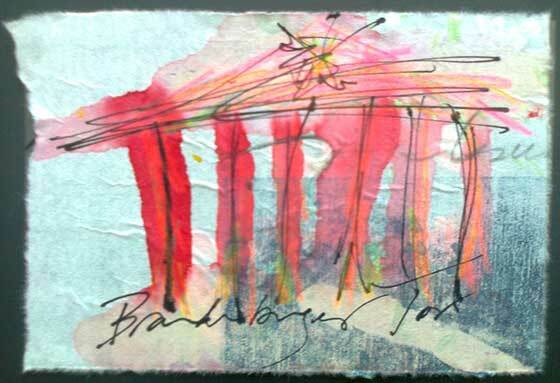 I crowdfunded the trip by selling my own Art Money with motifs from the original painting: Brandenburger Tor and angels above the city. 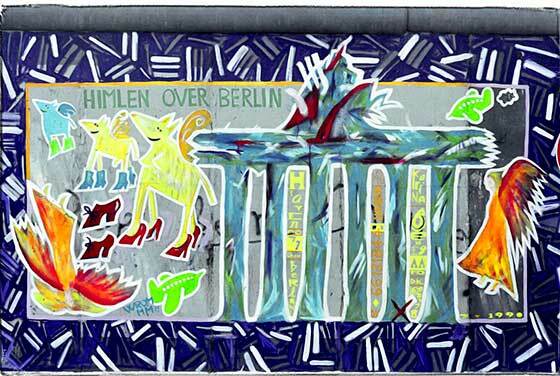 At the moment, it seems that the most probable outcome is that HIMLEN OVER BERLIN/HEAVEN NO. 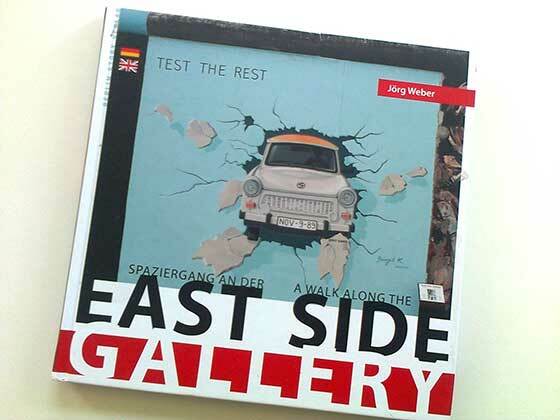 7/7 ÜBER BERLIN will be forced in permanent exile behind East-Side-Gallery, but I really hope that my art will be reunited with the rest of paintings or that I get the chance to paint a new version on one of the white parts of East-Side-Gallery. 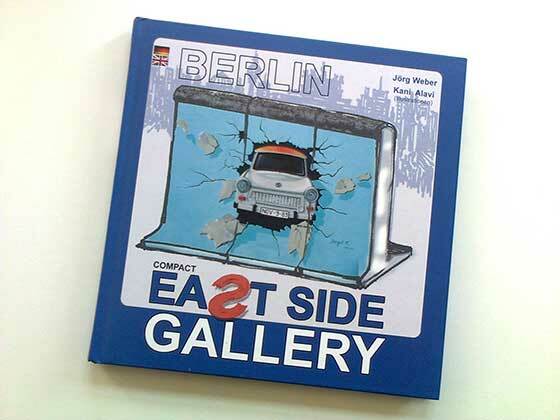 My exhibition in August ’17 was at Galerie Djesany, Weserstrasse 11, Berlin/Neukölln. 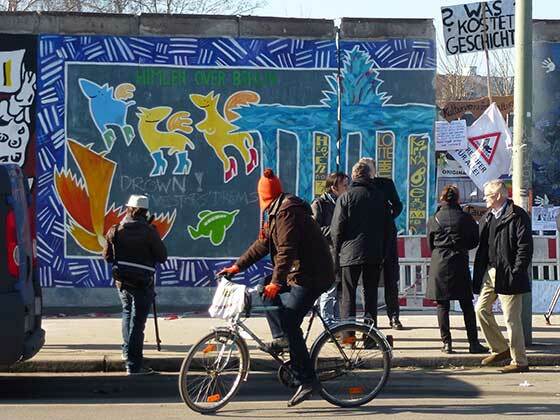 I exhibited large woodcuts of Ferocious Fish and Art Money with motifs from my part of the painting: Brandenburger Tor and a few angels. 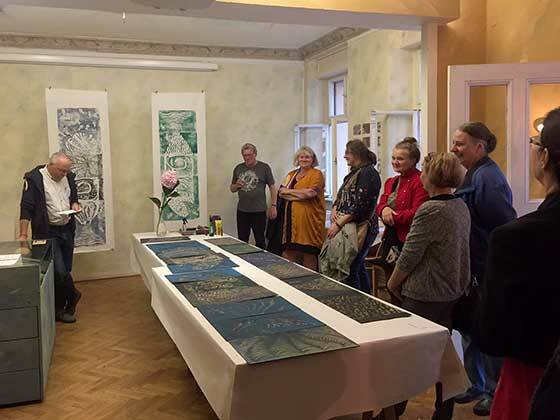 We printed big woodcuts live at the opening.